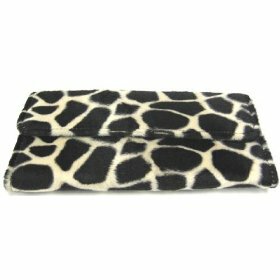 This modern faux fur giraffe checkbook holder/wallet will be a great addition to your Fall/Winter wardrobe. The spots are a dark brown almost black with an off white background. Featuring a magnetic clasp and a nylon interior lining, this wallet features:Window view ID or license slot5 Credit card slots. Sleeve for holding checkbooks. Magnetic snap to secure wallet. It measures 7 1/2″ X 3 1/2″ when closed, 7 1/2″ X 9 1/2″ when opened. We have a very limited supply of these, so don’t miss out. Get yours now!